THE Fitters’ Workshop provided a cosy refuge from the chilly winds which accompanied this rewarding, and beautifully staged sampling of the works of four Russian masters. The major work of the evening, Shostakovich’s “Piano Quintet in G.Minor, Op.57” was written in 1940 for pianist and string quartet. On this occasion the pianist was Daniel De Borah whose confident approach to the work’s complexities was echoed in the very fine performance of the Tinalley String Quartet, led on this occasion by guest violinist, Eoin Anderson. Two works by Scriabin, his “Sonata No.4 in F Sharp Major, Op. 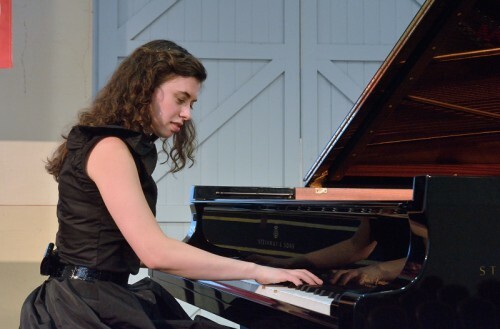 30”, stunningly executed by Maria Mazo, who has become something of an audience favourite throughout the festival, and the lovely poème “Vers la flamme’ for piano, Op. 72” with its unusual harmonies and tremolos sensitively highlighted by Gabi Sultana, provided contrasted examples of his output. There were also two Stravinsky inclusions. The first, his four-song cycle, “Pribaoutki”, which featured Andrew O’Connor, obviously relishing the opportunity to exercise his rich bass-baritone with the nonsense rhymes, and with the ANAM wind and string players, conducted by Roland Peelman, providing superb accompaniment before continuing on to give an excellent account of the march, waltz and polka which make up Stravinsky’s 1915 composition “Trois pieces faciles”. The real highlight of the night however was the spine-tingling, a cappella rendition of the Rachmaninov vesper “Blessed is the Man” which was given an impeccable performance by the Song Company and YAFF vocalists, conducted by Peelman, while also providing a reminder of the beauty of The Fitters’ acoustic for this type of performance.